Presenting our custom designed courses and workshops, to South African Police, (the Hawks), anti-poaching units, Department of Environmental Affairs - Green Scorpions, prosecutors, magistrates and customs (SARS) ports authorities. These are presented around the country. Liaising with law enforcement and providing evidence, affidavits and statements for court dockets. Appearances in court proceedings: providing evidence in aggravation of sentencing of pangolin poachers. We have testified in more than 15 cases over the past three years and achieved the first jail sentence in November 2017. This number continues to grow since this first precedent-setting conviction. The African Pangolin Working Group work very closely with law enforcement on the ground involving the seizure of traded wild pangolins. 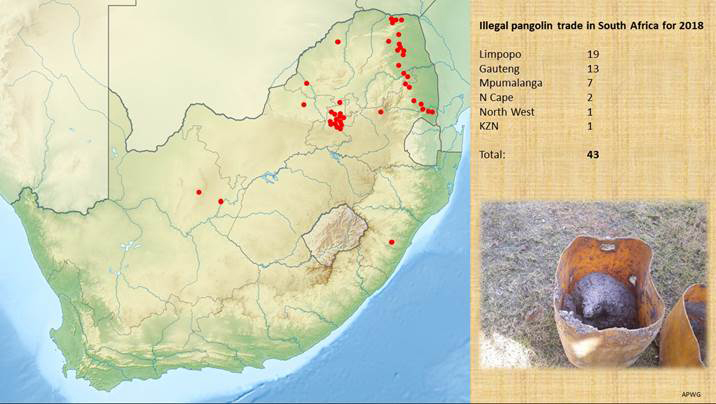 We assist the South African Police Service with sting operations and assist the Environmental Management Inspectorate of the Department of Environmental Affairs with Chain-of-Custody sampling of these trafficked pangolins. This is vitally important in the court case hearings of the accused traffickers that follow arrests. Our organisation also assists the judiciary in species identification of confiscated pangolins and scales and we provide court statements and appearances at court hearings in providing testimony in aggravation of sentencing against the accused prior to being sentenced. 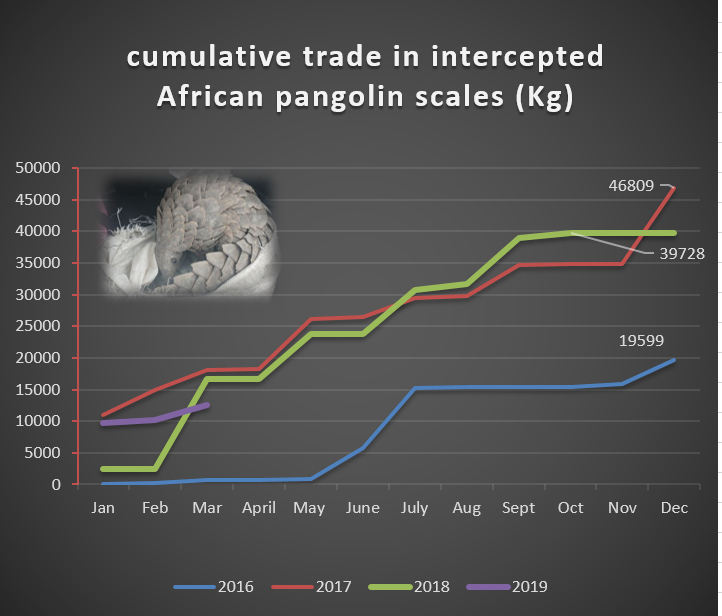 Prior to 2016, a person trading in pangolins had yet to be sentenced to a jail term in South Africa. We have been subpoenaed to a number of cases involving pangolins and in October 2016 we convinced the magistrate in Mankweng regional court to sentence the accused to a jail term of three years. In January 2017, a Zimbabwe national was sentenced to a term of seven years following our testimony; setting a landmark precedent for pangolin poaching in South Africa. Since that first jail sentence, there have been another seven jail terms handed down, including three of seven years each. We offer training for magistrates, state prosecutors and the South African Revenue Service Customs officers as to the law governing pangolins, the protection status around pangolins and the global wildlife trade pertaining to pangolins. This awareness training is vitally important as the majority of magistrates and prosecutors are unaware of the precarious position pangolins are in and the very real possibility of their extinction directly as a result of poaching and illegal trade primarily as an ingredient in traditional remedies in Asian medicine.